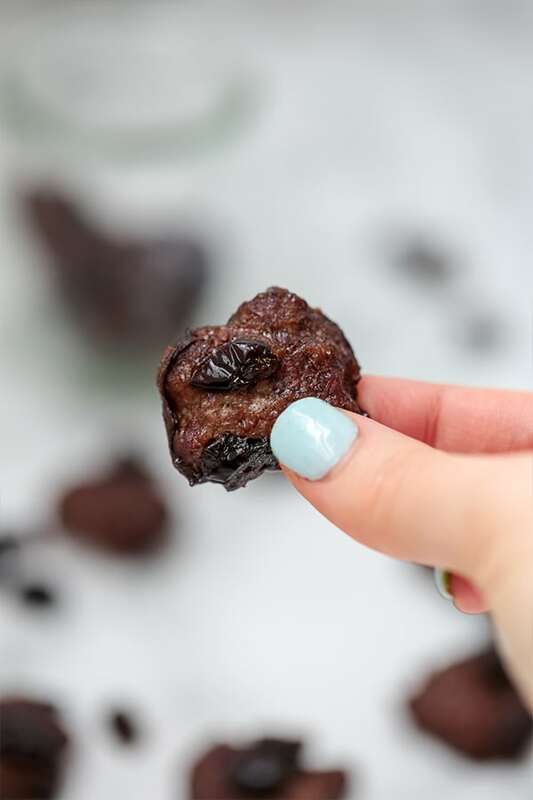 These cranberry beef jerky bites are an easy protein snack on the go! 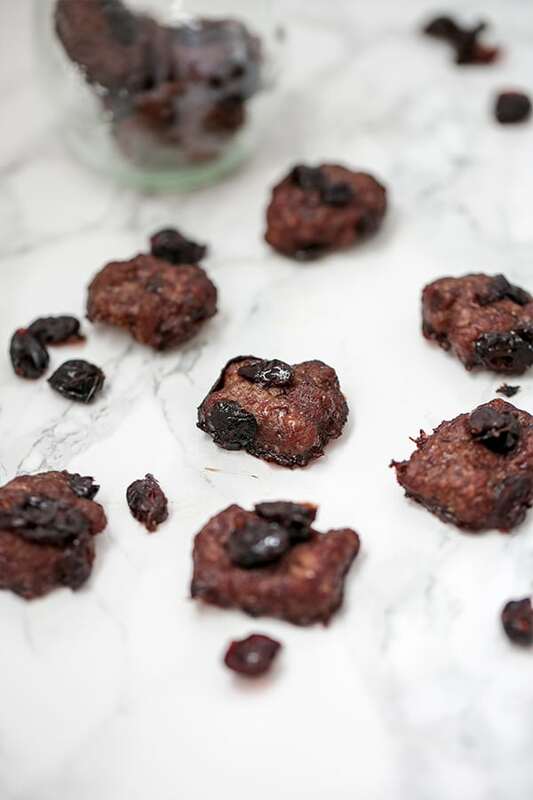 They’re made in the oven with only 5 ingredients and are paleo, whole30, and AIP compliant. I have a confession to make… I have a serious thing for Epic bars. I mean, I am obsessed with these things. I truly think that one of the hardest parts of every whole30 I’ve ever done is giving the bison bars that have added sugar! I am forever grateful to Epic Bar for making such a great snack on the go. But, my addiction can be a bit expensive and add a bit more added sugar than I’d like. So, why not make my own? 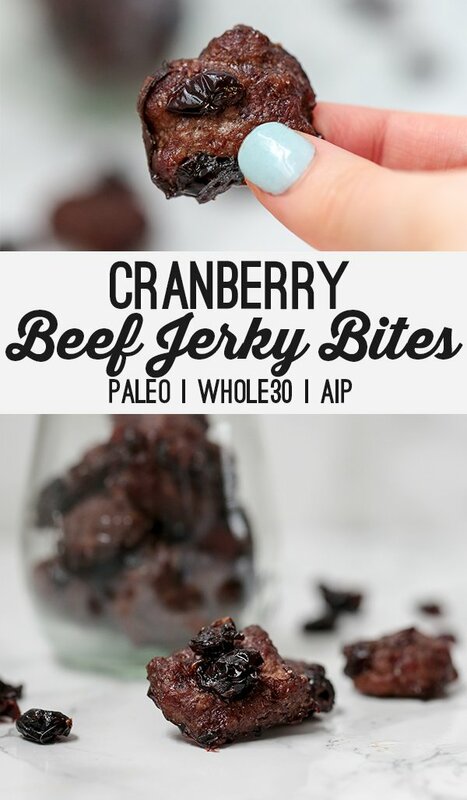 These cranberry beef jerky bites are the perfect protein-dense snack with just a touch of sweetness! I was skeptical that they would really turn out that well, but I was so pleasantly surprised by how much I loved them! Between my husband and I, these guys were gone in less than 24 hours. So, does my jerky bar addiction have competition? ABSOLUTELY. Pre-made jerky bars can get pretty pricey. Making your own allows you to control the cost ingredients. Just slice them up, pop them in the oven, and forget about it until it’s done! You don’t need a dehydrator for this one. Not only are fewer ingredient recipes arguably easier to digest, but it’s also easier to make and far less fussy to shop for. They’re only naturally sweetened, but they taste awesome. Pre-made jerky bars usually have some sort of sugar, but you just don’t need it here. Fresh beef that wasn’t previously frozen always works best for jerky! You want minimal moisture to allow it to dry quicker, and previously frozen always tends to have more moisture. You also want minimal fat as it helps it dry faster, so a lower fat cut on ground beef works best. Yes, fat is still good, and you’ll still get healthy fat from the beef! It just helps it cook faster. You’ll want dried cranberries that don’t have any added sugars or oils, like this brand. 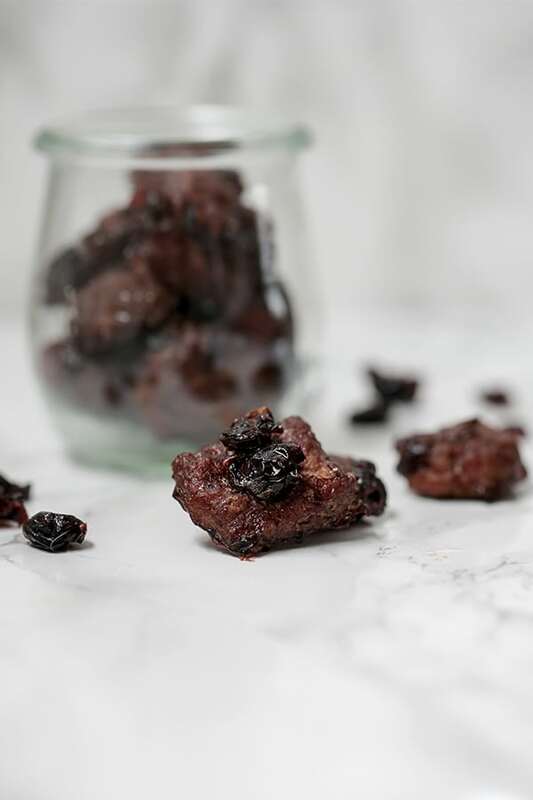 Most dried cranberries that you get from the store have sunflower oil and sugar, so be careful to skip out on the unnecessary ingredients. You can also use something like dried blueberries! Coconut aminos is a gluten free, soy free alternative to soy sauce. You can buy this online or at most health food stores these days. It adds a bit of moisture, but it also adds just the right amount of flavor to keep the bites from being bland. A good quality sea salt will work. Omit the pepper if you’re AIP! Add the raw ground beef to a large bowl and mix with the coconut aminos, cranberries, salt, and pepper. Spoon out about 1-2 tsp of the ground beef mixture at a time and form it into small squares. Flatten the bites with your hand to about 1″x1″. You want the bites to be flattened, but not paper thin. Evenly space the bites. Bake in the preheated oven for about 3-4 hours, flipping the bites at the halfway point. Check on the bites often as the cooking time will vary depending on the thickness of the jerky bites and your oven. Remove when browned on both sides and internal temperature reaches 160 F. Pat the bites dry of any excess fat. These look yummy! Do they need to be kept in the refrigerator? I am traveling soon and this might be a great protein to take with me on the airplane! It would be best to bring an ice pack. If they’re fully frozen, you can get it through security. Hi Michelle! These look delicious. How long will they keep in the refrigerator? Thanks! I keep them for about 4-5 days but I assume it may go longer!